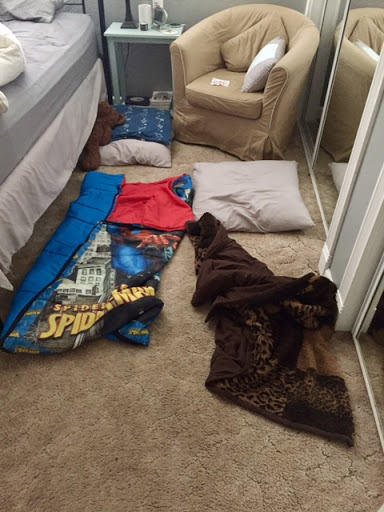 Our boys sleep every night in the floor of our bedroom. Whew, that felt good to get off my chest. Right now you may be thinking, “all that build up, and that was it? !” I know. It’s ridiculous. Which is why I shared it. I’ve been holding on to that information like it was the one thing that could destroy me for a while now, and I’m tired of it. As parents it’s almost too natural to try to hide the things that we are a little less than sure of as we make our way through this whole parenting gig. Since Little Man was about 4, due to nightmares, he has begged to sleep in our room. We had finally got him to be ok staying in his room, and then we moved. Starting over proved futile, and he has been a permanent fixture in our floor ever since. He does have to start out in the room he shares with the twins, but every night, like clockwork he quietly makes his way in, sleeping bag in tow, and settles himself in. Over the last year, he has brought two new additions in the form of his brothers with him. 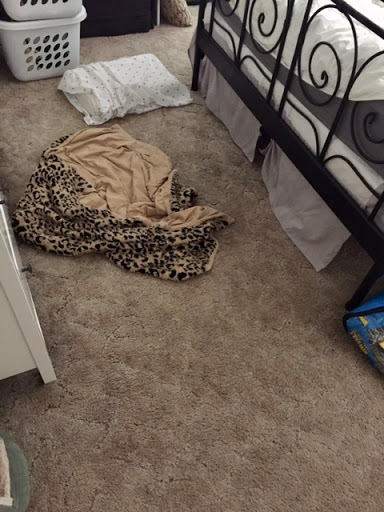 It’s gotten to the point now that before we go to bed, Franz lays out blankets and pillows to avoid being woken up by croaky little voices asking his help in laying down. For a long time I fought it. I got frustrated, and cranky, and was willing to bribe them all to JUST STAY in their OWN ROOM. I didn’t want to be the “weird” family (yes, I know that ship sailed long ago. I christened it), or have people think my children were somehow lacking in something…like the ability to sleep like normal people. But at some point, I have come to not only accept this strange nocturnal activity, but even appreciate it. There will come a day, when they don’t need to be near us to feel comforted. They will sleep through the night in their own beds, and I won’t have to tiptoe around little heads for middle of the night bathroom trips. The other day I overheard Ryan telling Franz he would never leave us because “I would miss Mommy too much!” It warmed my heart. I must not be failing too hard if the thought of leaving me is sad to him. This world is a harsh place, a hard place, and often a painful one. If I can be my kids’ shelter from the storm, their safe place when they are scared, then I want to be that. Even if it means my room often resembles a little transient camp. There is nothing shameful in that. And I need to be ok with it. Sometimes I think I’m behaving more like the disciples, when they tried to keep the children from “disturbing” Jesus, causing a distraction, showing up at an inconvenient time. I need to be more like Jesus, welcoming them in, making them feel wanted and understood. Heard. Loved. As their closest representation of what a heavenly parent looks like, I should be more concerned about portraying that, than I am about doing the “normal” thing. I read a parenting quote once that went something like “fill your child’s bucket so full, that even when the world pokes holes in it, it won’t run dry.” My goal is to be a bucket-filling-loving-them-like-Jesus parent, and I’m going to have to be ok doing that in ways that don’t always seem ‘normal’ to me. For now, that means allowing my room to be invaded by rosy cheeked, half asleep wanderers, but someday, hopefully that will translate to three confident young men, who know the love of Jesus, and their mama…from the appropriate distance of their own rooms. So, now that you know my deep, dark secret, can I challenge you to have another look at something you’ve been holding onto? Something that perhaps you were afraid to admit out loud, and maybe see it as a blessing instead of a bad thing? Parents or not, we were all born with a God given purpose to be who He created us to be, and love others in the process. Sometimes, we just need to embrace our lack of normal, and accept our weird/unique/different. I’ve heard normal is overrated anyways. Bless you for your transparency. You are an amazing momma. Jen,this is a topic that has really bothered me regarding our two girls. There's a ton of psychological theory why sleeping with your kids is bad, and one famous dissenter(Dr Sears) who has written a book why it's good. Our girls were shuttled off to their own rooms as babies. But the happiest times we ever had as a family were when we all slept together in a tent when camping and backpacking. I really regret not extending that back to our life at home, although Janet disagrees with me about that. I can tell you that worldwide, most families sleep together.